President Barack Obama tries to keep his laugher under wraps as Joe Biden tells him its a “big f*@!ng deal” that they got the 2010 healthcare bill signed. And yes, Mr. Vice President, you’re right…. Following his selection as second-in-command to President Barack Obama, Joe Biden conceded that there may have been a better candidate! Hillary Clinton is as qualified or more qualified than I am to be Vice President of the United States of America. Let’s get that straight. She’s a truly close personal friend. She is qualified to be President of the United States of America. She’s easily qualified to be Vice President of the United States of America. Quite frankly, it might have been a better pick than me. But she’s first rate. Back in the 1980s, Joe Biden ran for President and found himself in hot water when it became clear he used passages of other politicians speeches without giving credit. The controversy led to more footage surfacing of Biden inflating his academic record at law school. The exaggerations could have come back to haunt him again in 2008 when he failed to count the number of letters in the word ‘jobs’ correctly. Back in 2007, Biden had his eyes set on the top job in Washington and put himself forward for the Democratic Party’s 2008 presidential election nomination. I mean, you’ve got the first sort of mainstream African American who is articulate and bright and clean and a nice looking guy. I mean, that’s a story book man. Later, he called Obama to smooth things over and the future president released a statement saying he didn’t take the comment personally. However, he added that they were “obviously historically inaccurate”. 5. Ladies and gentlment, your superhero – Barack America! To this day controversy follows Barack Obama around because of his name and ancestry. Introducing his close friend ahead of the 2008 election, Biden tried to sort out the issue by calling the future president, Barack America! Footage captured by C-SPAN’s “Road to the White House” series show Biden “bonding” with an Indian-American Supporter in Delaware. He claimed that he has a great relationship with Indian-Americans because in his native Delaware “you cannot go to a 7-11 or a Dunkin’ Donuts unless you have a slight Indian accent”. 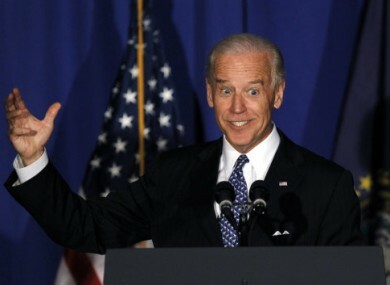 In case you were unclear, Biden ensures us, he’s “not joking”! 7. Stand up Mr Graham! In probably his most famous gaffe, Biden asked state senator Chuck Graham to stand up at a campaign rally. When his request wasn’t immediately followed, the Democrat realised Graham was confined to a wheelchair. His response? To get everyone else to stand up instead! When Brian Cowen visited the White House on St. Patrick’s Day 2010, Biden was quick to console the Taoiseach on the loss of his mother. “God rest her soul,” he told Cowen, despite the fact that his mother was very much alive. It was the politician’s father who had passed away. Email “Joe Biden specials: 8 of the American VP's major gaffes”. Feedback on “Joe Biden specials: 8 of the American VP's major gaffes”.